It sustains the health of digestive system by ensuring normal gastric acidity, gastric mucosa protection and reducing of Helicobacter pylori load in the stomach. Ingredients: calcium carbonate, microcrystalline cellulose, stabilized Lactobacillus reuteri, deglycyrrhizinated licorice root extract (Glycyrrhiza glabra), magnesium stearate. Recommended for sustaining the health of digestive system by ensuring normal gastric acidity, gastric mucosa protection and reducing of Helicobacter pylori load in the stomach, in children over 12 years of age and adults. 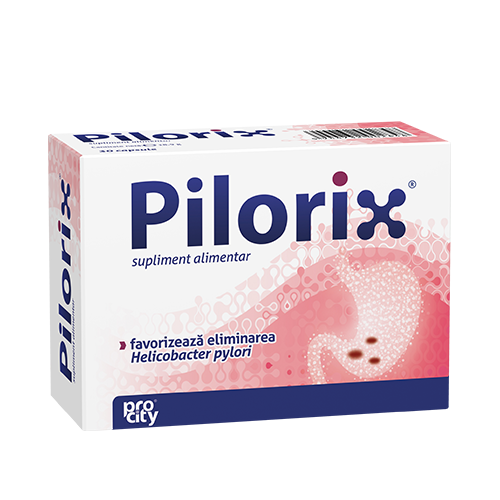 The efficacy of PILORIX administration is not influenced by the concomitant treatment with antibiotics, because the Lactobacillus reuteri strains are stabilized. Children over 12 years of age and adults: 2 capsules/day, before meal, for 2 weeks. Store at temperatures below 25Â°C, in the original packaging. Keep out of the reach of small children. Do not exceed the recommended dose for daily consumption. The product is a dietary supplement and should not replace a varied and balanced diet and a healthy lifestyle. Cardboard box containing 3 blisters with 10 tablets each.